Off to Pau in France for a weeks hols in a few weeks time. This is very close to the central section of the Pyrenees, so fancied doing a bit of caving whilst there. Can anybody tell me of some good places to go which don't involve sliding up and down ropes. My partner has done only a little caving, so something like Swildons would be ideal. We'll also be visiting the Spanish side of the Pyrenees. It's a place I've never been to, so any help will be much appreciated. Many thanks. The Traverse of the Bidouze (close to Mendive 60k from Pau) is a good one. not too long, fairly aqueous and only one 18m pitch. The Goueil d'Hyer at Arbas ( an hour from Pau) is another that is wet and entertaining to the sump and requires no ropes. Pau to Dordogne, think Mendip to Yorkshire. Trou de Mille in Arbas (100km-ish down the A64) maybe. I did this about 25 years ago - I can't remember what the pitches (if any) were like, but there was a nice long streamway with climbs and pools. 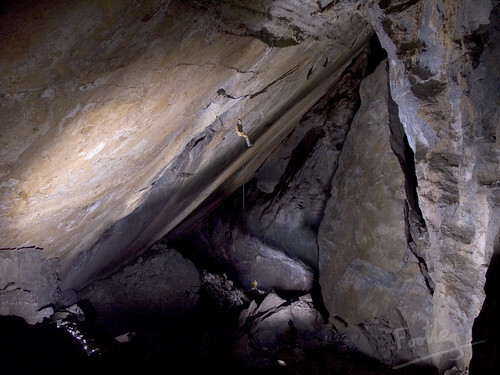 The Trou Mile is one of the many entrances to what most cavers would know as the Henne Morte/Felix Trombe system, although it is now known as the Coume Ouarnede, situated about an hour and a half from Pau. The resurgence to this system is I think horizontal (maybe one 6m pitch) I have had a trip in but can't remember if it worth travelling all the way from Pau, there is I think a through trip from another cave and out the resurgence but don't have any details. Thanks for that input folks, much appreciated. I'd love to say we did all the recommended trips and that they were all great. But sadly, I realised that taking kit for just 1 trip wasn't worth it. But we did go to the Grottes de Betharram, show caves are just so much easier! And what an amazing cave it was. Huge passages, a boat ride, and even a train journey. Well worth a visit. Only just came across this thread, but for future reference the Trou Mile to Heretics makes for a superb and not technically difficult through trip. You would need to rig Heretics first (3 easy pitches) or do an exchange trip with another group. If you pre-rig Heretics then you can pull through all the pitches in the Trou Mile (it is more of a Swinstos than a Swildons). A short grovelly crawl connection with the bottom of the Grand Salle of the Trou du Vent and walk up this impressive steeply sloping chamber to exit via Heretics. Best learn the way from the chamber to the pitches out by doing a rigging trip of Heretics the day before.